As you may have noticed from some of what I pointed out in my Frankenstein reviews, I am big fan of Doctor Who. I felt that these horror based adventures featuring the Eighth Doctor traveling with Mary Shelley, the author of Frankenstein, were in line with the theme I have going. If you don't know anything about Doctor Who, I'd move on. But, if you're a fan of the old series or a new fan looking to check out some of the old Doctors, Big Finish's Audio plays are a fantastic way to get a feel for the 4th, 5th, 6th, 7th and 8th Doctors. Especially the Eighth, who only got one crappy (and I mean really bad) TV movie out of the series. It is a fateful night in Switzerland 1816 when Lord Byron gathers his guests to tell ghost stories. Out of nowhere an insane man appears calling himself Doctor Frankenstein. This is one part of a four story set, but it has nothing to do with the other three. How can I not love that set up? It is the season I decided to start the Mary Shelley series. 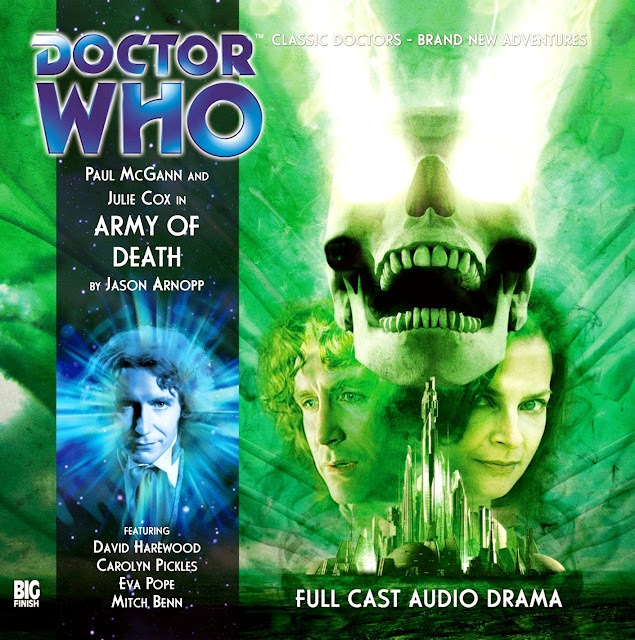 If you are new to the Doctor Who audios, this might be a tough one to tackle since it is not the nicest jumping on point to the Eighth Doctor or the audios, but I'd say give it a shot if you know about Doctor Who. It has some fun with the ideas in Frankenstein and the romantic writers themselves. Plus the descriptions are creepy in all the right ways. Mary Shelley is our heroine and she is witty and determined. She sides with the deformed creature and even laments on the horrors inflicted on it. Naturally it references how Mary show how the Monster isn't evil in Frankenstein. The Eighth Doctor doesn't get the most screen time and mostly serves as a catalyst to the story. I can't say too much without spoilers, but you get to know him a bit more toward the end. Lord Byron and Percy Shelley do not come off well in this story. Mind you, they are quite entertaining in their drug induced fervor. 'Doctor Frankenstein' is both appropriately savage and sympathetic. He is the force of unpredictability and mystery he should be. The mansion ans surroundings are set up as stifling monsoon with special attention paid to Doctor Frankenstein's shack is superb. The end is the same as all first companion stories and Mary's reactions to all the events make her just right. This is just the start to a beautiful partnership. As I mentioned at the start, I'm not sure how easy this will be for a newcomer to the audios. Prior knowledge of Doctor Who is necessary, though I wouldn't say you need to watch the movie necessarily. It is only a dollar for the 25 minute episode, so it is well worth the risk! I loved it and would recommend it to any fan of the Doctor, new or old. You can also get the full 4 story set here. The Doctor attempts to take Mary on a simple trip to Vienna and gets there 57 years into her future. It is the 1873 Vienna Expo and a mysterious new invention is being shown: The Silver Turk! One of the creepiest audios I've listened to in awhile and I chose to listen to it while jogging around midnight... 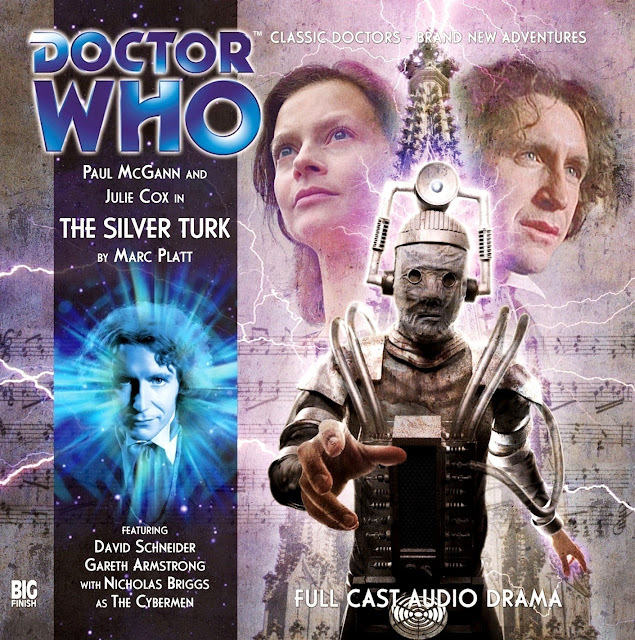 This is one of those audios that makes me long for classic Cybermen stories. From the creepy nursery rhymes to the eery Cybermen murmurs to the booming voice of the marionette master, this audio's first three chapters will have you on the edge of your seat. The ties to Frankenstein are nice, especially since the Cybermen are quite comparable villains to Frankenstein. The Eighth Doctor starts out with his usual cheerful attitude, but once the Cybermen appear he becomes obsessed with discovering their plot. His passion and fear at what the Cybermen can do really drives the first three chapters with a frenetic intensity. His knowledge of the Cybermen's past evils also nicely parallel Mary's own view of the Monster as redeemable. Mary Shelley is a superb companion. She has fantastic observations on the situation as well as the absurdity of time travel. They also have a bit of fun with her anachronisms, since they are in her future. Mary's compassion for the Cybermen reflects her eventual writing of the Monster. Countess Mitzi Wittenmeier is an interesting character and goes beyond her side character role in making us care about the secondary antagonist as well as a few other side characters. She takes more realistic and self interested actions that give the story a more human touch. The taxi driver is good for a few laughs and to make some observations on the scene. Though largely relegated to extra he does add tension to several scenes. The main antagonist, Dr. Drossel, one ups the even the Cybermen in this. He really amps the creepiness of this story. His menacing threats drive both the terror and the mystery. His voice alone is enough to convince you that he will kill you and that he will believe it is to make a better world. The secondary antagonist is Alfred Stahlbaum. He ends up more as a plot device than anything, but his shared past with the Countess does make him ore interesting. The Cybermen, Brahm and Graham, should be the main villains, but I really ended up feeling for them by the end. That said, they are terrifying through the first three chapters of the audio. Their voices have just the right amount of heartless resonance to disturb. Also, the fact that they aren't in proper working order drives a desperation that makes them more threatening than all the Cybermen in the new series combined. The Vienna exposition is beautifully rendered with a joviality that belies the sinister happenings surrounding it. The mansion attack and the the church scene are brilliantly realized with the clacking of wooden feet and the sounds of the storm. The music is suitably timed to make this audio as scary as possible. The only problem with this adventure was the ending, which is the problem of most creepy stories, once you know what's going on, it loses its edge. There are still satisfying character wrap ups, but for the most part is by the book. Though, there is a somewhat amusing cliffhanger. This is a strong audio and I think it is great for any Doctor Who fan and even some horror fans. The story starts with men removing a stone from a well and a witch popping out and killing people. It is later split into two timelines: the 17th century and the present-ish (they have the internet and cell phones). The past story follows the Doctor takes up the most time, is the most convoluted, and has the most prejudiced characters. The present follows Mary and Aleister trying to escape the crazed witch. The Eighth Doctor and Mary, on their second outing together, are kept apart nearly the entire time. Given that a highlight of The Silver Turk was their interaction, I found choice stupid. There are a few good lines, but they just fall on the deaf ears of the supporting cast. While the main plot isn't interesting, there are slices of Mary being tempted to learn about her future. These scenes along with the interaction with her Byron-loving pseudo-companion are the best stuff this story has to offer. The Doctor also gets a few decent scenes of slipping past the guards, but spends most of his time trying to figure out what the heck is going on. Finicia and Lucern are twins who Mary rescues from the witch. They are obnoxious and too smart for their own good. Though, Mary slaps Finicia and that is hilarious. Master John Kincaid, the witch pricker, could be considered an antagonist, but he really isn't. He is a very stereotypical coward with power. I was waiting for him to do something more than give orders. Don't hold your breath. Squire Claude Portillon is a nobleman who has some misgivings about burning the witch. The problem is that he is so wishy washy that he has little agency of his own and ends up getting lead around by the nearest strong personality. His own kids manage to order him around. Anges Bates is a woman convicted of witchcraft, but is she really a witch? She play the madwoman really well and has some interesting, though badly explained, powers. Aleister Portillan is a modern fan of Lord Byron and my favorite of the supporting cast. His conversations with Mary got me through this story and I really wish it had been the entire story. He also takes some shots a Byron's attitudes and how they reflect on real people. The witch doesn't do much aside from kill people, though she is a menacing presence. More menacing than the other adversaries. The Viriyans are some of the most stupid and nonsensical villains ever. Several of their actions don't make any sense: cooperating with the Doctor at all, not just killing everyone to get their objective, all of their actions in the past's ending. Terrible. In the past we have a nicely set up town, fores, and mountain which we alternate between. The town is set up easily enough and transitions from place to place are well handled. The present is also handled fanatically between the well, the forest and Aleister's home. The witch's massacres are appropriately chaotic, but not so much that you get lost in them. I strongly dislike Doctor Who witch stories (Yes, even classic Doctor Who's The Daemons). That being said I do have practical reasons for disliking this one. Witch stories are often about blind prejudice. This topic that can be interesting, but when most of the cast is ignorant your heroes just end up talking to unrepentant brick walls. In this story there are at minimum four of this type of characters. None of them are terribly interesting and all of their reasons for their prejudices aren't based in fact or logic. Especially the two main villains who are villains because every said they were. So they figure why the heck not? I realize this is trying to be a parallel to Frankenstein's Monster become vengeful because of how others treated him, but one Monster does not compare well to an entire civilization. Plus we don't get more than a gloss over the species history in this audio whereas a least twenty percent of the novel shows us the Monster's back story. Ugh. Honestly, I'd skip this one. It isn't scary, it isn't very funny, it doesn't give you any insight into the subject nor characters and it isn't that interesting. Buy it here from Big Finish. The Eighth Doctor and Mary Shelley find a populace in the grip of fear after a terrorist attack blows up one of their major cities. The strange thing is that skeletons of the dead are marching toward the other major city, killing everything in their path. This one was definitely more sci-fi than horror, but I think works. I would have liked the terror of the skeletons and the ghostly voice that accompanies them played up more. Also I have to admit I was pleased to have skeletons rather than zombies. I know the difference is minimal, but good skeleton stories are quite rare. The Doctor and Mary manage a bit more time together in this adventure, which is nice, especially after the last one. Though I still don't think it was enough time, as they were separated from most of chapters two and three. The Eighth Doctor is in fine form managing politicians, killer skeletons and flybots with ease and humor. He even has a touching moment with Mary at the end about dealing with trauma. That is the strongest part of this story and makes me wish that they'd have more time together even more. Mary is forced more to the background during chapters two and three, but she manages to shine in the light she is given. Once again she empathizes with the baddies and speaks for them. There is a hinted romance with the Doctor, which is becoming cliche, but that plot line seems to resolve itself at the end. Nia Brusk is an escaped prisoner accused of murder. She has a redemption/revenge arc that flows nicely and should have been more prominent through chapters one and two. President Vallan and Lady Meera are the leaders of the remaining major city. Their most interesting aspect involves Vallan covering for Meera, but that subplot gets about one line. The rest of the time they are being pushed into doing others' bidding. The Skeletons are most terrifying at the beginning. I wish their terror had remained until late in the third chapter, but they are used well overall. The Bonelord ends up being more comical than threatening which is a shame because he had a lot of potential. He ends up being more scary as a disembodied voice than a skeletal giant. This adventure also has a complicated, if a bit nonsensical, political plot. I though this was probably the weakest aspect, though I did like the storyline involving Nia. It also shows the stupidity that people allow after a terrorist attack, as an American this theme hits especially close to home. Unfortunately they only glanced the surface of these themes. The Doctor and Mary's relationship really needs to be expanded in future releases. This contains an after closing teaser about Mary wanting to go back to her own time, but the time of this decision is left ambiguous. I personally want more the Doctor and Mary since it seems like there is a lot more to cover. Also, I'd like to see them focus on more of Mary Shelley's works than just Frankenstein. In Mary's Story the Doctor did mention a race that they haven't encountered, so the afterward could be set in the future. The setting for this isn't complex, but is is easy to follow. The cities and forest between them are set up nicely. You get a good feel for the destruction caused by the bomb. Also the skeleton attack scenes form easily in the mind. I'd say its worth a listen, especially for Eighth Doctor and Mary Shelley fans. 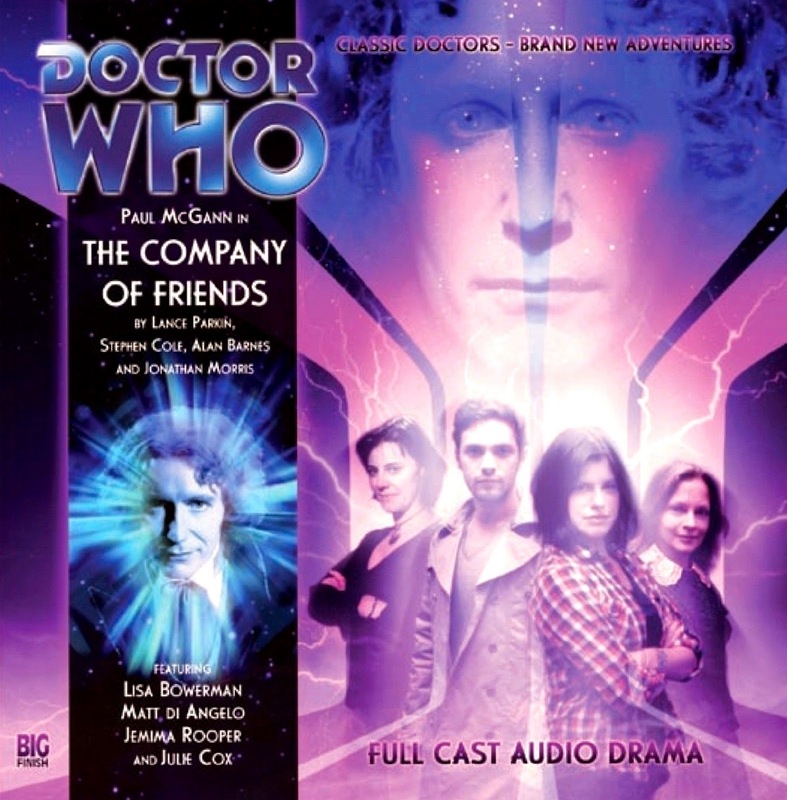 You can also check out a more complete set of Doctor Who and other reviews at Doc Oho Reviews.